Pediatric patients of all ages enjoy activities and special events in our Recreation Center. 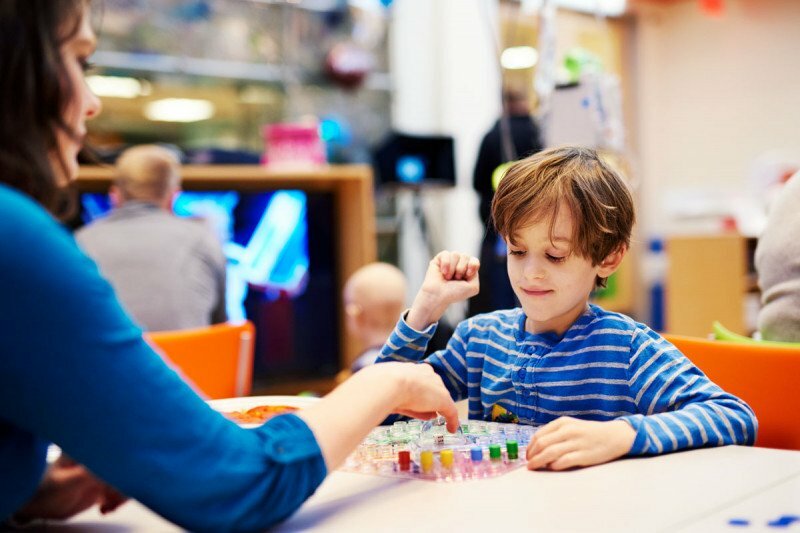 Our pediatrics experts at Memorial Sloan Kettering will care for your child, adolescent, or young adult in the Claire Tow Pediatric Pavilion — a custom-designed, light-filled, and brightly colored environment. The Pediatric Pavilion includes our outpatient Pediatric Day Hospital and our inpatient units. In addition to treatment, we offer a wide range of supportive services to enhance your child’s quality of life and ease the experience of cancer for your family. We provide the majority of our pediatric cancer care on an outpatient basis in the Claire Tow Pediatric Day Hospital. The heart of this facility is our Recreation Center. The Day Hospital also includes a classroom for our school program; a room designated for our teen and young adult patients; suites with the latest medical technology; private areas for consultations and treatment; and treatment and lounge spaces with wireless Internet access. Our inpatient units feature rooms where your child and family can access multimedia entertainment and the Internet. Children can also participate in group activities, including school instruction, from the bedside. All of our inpatient rooms have comfortable caregiver accommodations, so you can remain with your child overnight. Other amenities include a patient activity center, family lounge, and pantry. Children who need more-intensive inpatient care stay in the Pediatric Intensive Care Unit, located on the same floor.